Advanced Feats: The Summoner’s Circle Now Available! One of the most daring new classes from the Pathfinder Advanced Player’s Guide, the summoner lets your imagination run wild creating your own monster—from flight of fancy to darkest nightmare. Is your eidolon a two-headed black serpent that breathes fire? Or a giant flying albino ferret that swallows its victims whole? Anything’s possible with this new character class. Your journey into the world of the summoner begins with a class breakdown highlighting its strengths and weaknesses. From there, we bring you 30 new feats to take your summoner to the next level. Your eidolon can throw your victims over a bridge with the Toss Foe feat. You can transform your wall of stone into a castle parapet with the Wall Master feat. You can even use your summoned monsters as a personal blood bank with the Vampiric Summoning feat. Three full character builds from levels 1–20 show you examples of how to bring all the pieces together to make fun and powerful summoners or to quickly work up an NPC to terrorize your players with. The cunning chess master who creates a monster-filled maze on the battlefield, the mythic rider astride his flying cat beast, and the master of arms fighting by the side of his serpentine Cuisinart of death: each is a wholly unique concept with its own style of play. 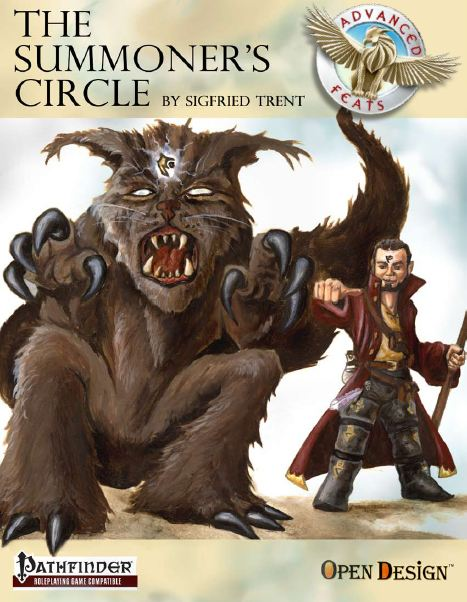 You can get Advanced Feats: The Summoner’s Circle in PDF format at the Kobold Store. Also, check out Advanced Feats: Secrets of the Alchemist or The Witch’s Brew—and stay tuned to see which class Sigfried tackles next month! You can extract life essence from the creatures you summon. Benefit: Whenever you summon a creature using a summoning spell or spell-like ability, you may reduce the summoned creature’s starting hp by its HD value and apply an equal amount of healing to yourself. Commentary—Over the long haul, this feat provides a fair number of hp, but any given summoned creature is not likely to have a big impact in your health. I found that for a caster who is a dedicated conjurer, the feat options are pretty slim. Metamagic is not often very useful and badly dilute them. Ooh, yes! Very fine idea indeed. I admit that Sigfried’s brain works very differently from my own sometimes. And one of those “sometimes” is when he gets into feats/character build mode. He’s just unstoppable. BTW, this one has an added bonus of an eidolon record sheet crafted by my lovely wife Anne. It’s definitely handy as an eidolon is just about as complicated as the summoner is. I’m surprised there aren’t more comments here; I hope the PDF is doing well. I kind of figured that the Summoner would be a more popular class. Well, we got the blending appliance market nailed down apparently! I’m happy to say Summoner’s Circle is doing pretty well, the Witch and Alchemist have sold more but they have a head start. Advanced Feats managed to get 3 of the top 10 pathfinder compatible download spots on Paizo the last week including #1 and #2. Summoner is my favorite of the 6 classes in the series although it was also by far the hardest of the pieces to write.